Viruses take energy and nutrients from their hosts. BUT it also takes energy to FIGHT viruses! In us humans, eventually, either the host or the virus dies. But, BATS can carry viruses for YEARS. How? Peng Zhou [Peng JOH] in Chinese Academy of Sciences hoped to answer this question. Bats fly and use LOTS of energy. This stress causes damage to DNA. When DNA is damaged, it floats out of the nucleus and into the rest of the cell. In human cells, viruses can cause DNA to LEAVE the nucleus. The misplaced DNA ALERTS the immune system. Then your body fights the virus! 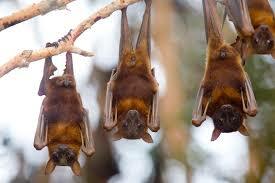 By comparing bat and human genes, researchers found that bats have a different DNA-sensing gene. Bat cells respond LESS to floating DNA – it’s normal for them! Viruses go undetected! If the bat survives, the virus does, too. Take that, Joker! Some human illnesses like arthritis arise from an OVER-response of our immune systems. Using BAT POWER to lower that response, without turning it off, could cure some tricky diseases! Batman – fighting crime AND viruses! Tights and cape – optional!